The final book in the Twelfth Imam series, Damascus Countdown, lives up to its designation as a political thriller. The Muslim "messiah" is in control of Iran's nukes and the Pakistanis are looking to join the Caliphate. Between Iran's nukes and those of Pakistan, there's enough firepower to wipe out both the Little Satan, Israel, and the Big Satan, the United States. In the last book, Israel launched a preemptive strike against Iran's nukes. They got most of them, but there are two unaccounted-for. All of Israel's neighbors except Syria are striking back with missiles. David Shirazi, undercover CIA agent in Iran, and his paramilitary team are racing against time to find and destroy the last two nukes. I don't want to give away the ending, but Syria does get involved. The Twelfth Imam wants to launch the two nukes at Israel from Damascus. The drama keeps you reading. Is Israel doomed? Can David's team stop the launch? 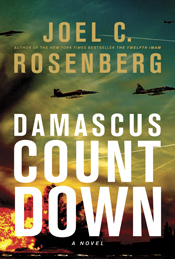 Damascus Countdown is definitely a thriller. I highly recommend it because Rosenberg lays out a very believable scenario on how the conflict in the Middle East might end. He knows current politics and the players. He's an avid supporter of Israel, and it shows in the story. His characters are well-developed and believable. Some have criticized his inclusion of Christian evangelism by the characters. That did not bother me, although it did interrupt the flow of the story at times. I only started reading this series because the first book, The Twelfth Imam, was offered free on Kindle. I guess that marketing ploy worked, because I was hooked. I definitely wanted to finish the series. See my review of The Twelfth Imam here. I also reviewed the second book, The Tehran Initiative. The author offers a free chapter on his website here. Note: I borrowed this book from my public library.